The MiniCat Catamaran has been designed to be a Ultra Lightweight Catamaran which is small enough to be stored in a cupboard at home and light enough to be loaded in your car for a holiday. The MiniCat can be packed into One bag weighing just 35 kg. This is a unique sailing boat - a catamaran with inflatable floats. It is small and light, but a full-bodied, fun sailing boat. Fully portable, it fits in a single bag (1,350 x 300 x 400 mm), so you do not need a trailer complicating your journey. Simply load the bag and go. For all fans of sailing and water-sports MiniCat offers the perfect, affordable opportunity to own a sailing boat without any storage or transport worries. The MiniCat can also be assembled single-handedly in just 30mins. The MiniCat frame, to which the floats attach, consists of rigid, transparent polyester sections on a light-weight aluminium frame. The trampoline is produced from high strength woven plastic fabric and the transparent polyester seats are designed for comfortable sailing. 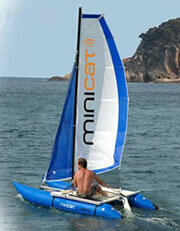 The MiniCat is equipped with two inflatable floats 3.1m length and 30cm diameter . The floats are made of reinforced 'Valmex' , highly resistant to abrasion and very hard wearing . This material and production technology was adopted from the production of 'white-water' rafts. The keel fins have been designed to attach under each float. Their design and shape gives excellent performance yet still allows the boat to be sailed in very shallow water without the risk of damage. The mast consists of three sections of equal length, slotted together. The length of the assembled mast is 3.8 m. The main sail is an 'all-spire' construction, i.e. without a yardarm and is made from the material 'Dimension Polyant' which has a surface density of 175 g/m.